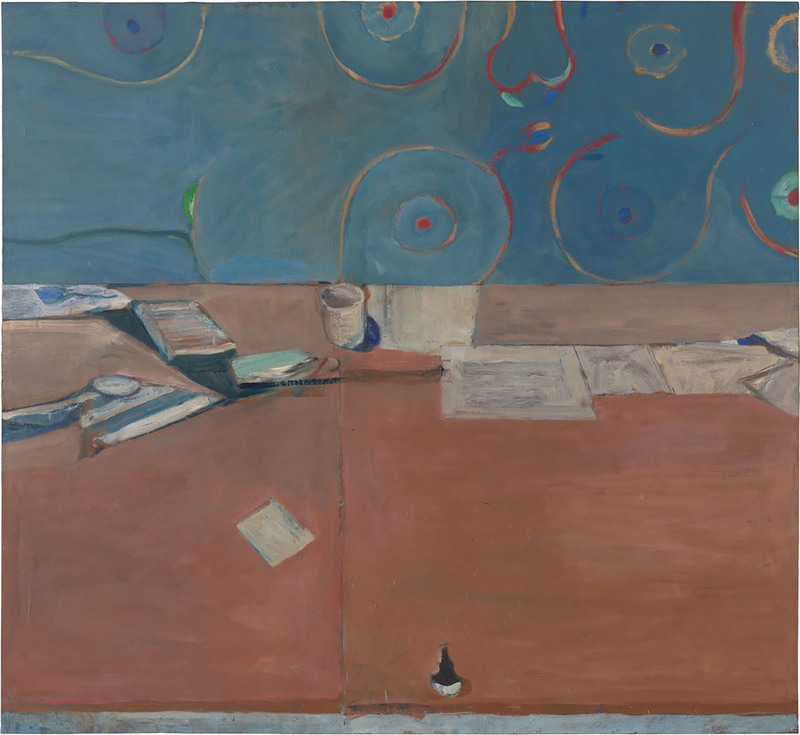 Matisse And Diebenkorn 'Meet' At Last, At The Baltimore Museum Of Art Henri Matisse and Richard Diebenkorn never met in real life, but a new exhibit feels like a conversation between the two artists. Across decades and continents, Matisse influenced Deibenkorn's work. Throughout his career, American artist Richard Diebenkorn studied the work of French painter Henri Matisse. They never met in real life, but a new exhibit at the Baltimore Museum of Art feels like a conversation between the two artists. 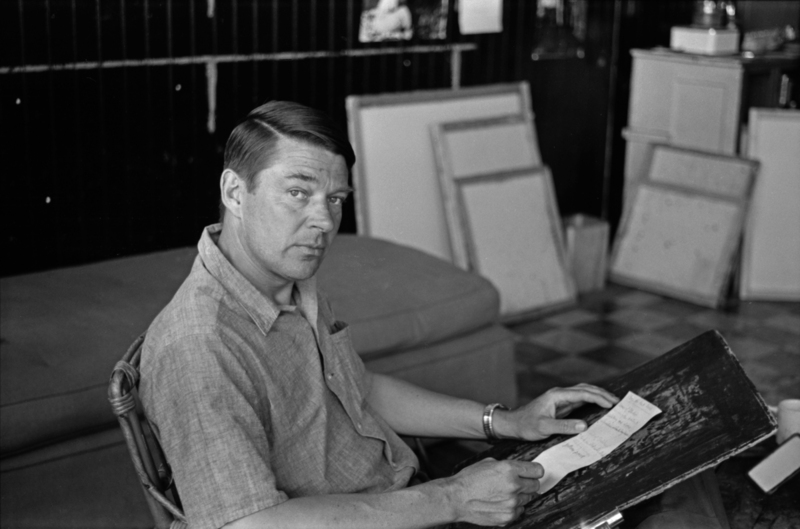 Diebenkorn is shown above in his studio in Oakland, Calif., in 1962. Matisse's great-granddaughter and Diebenkorn's daughter got to see the exhibition before it opened to the public; Gretchen Diebenkorn Grant, 71, and Sophie Matisse, 51, met for the first time at the Baltimore Museum of Art. "My whole life we all looked at Matisse the whole time," Grant tells Matisse. "That's funny, me too," Matisse laughs. Curator Katy Rothkopf began thinking about getting Matisse and Diebenkorn (the painters, not the descendants!) together some 15 years ago. She was poking through the Baltimore Museum's storage room when inspiration struck. "We had this spectacularly beautiful Diebenkorn drawing of a woman seated in a chair," she says, "and realized it had incredible resonance with a Matisse drawing we also had of a reclining model with a flowered robe. They were made 40 years apart, and were done by men living in different places, with different lifestyles, but yet, here they were, needing to have a conversation." 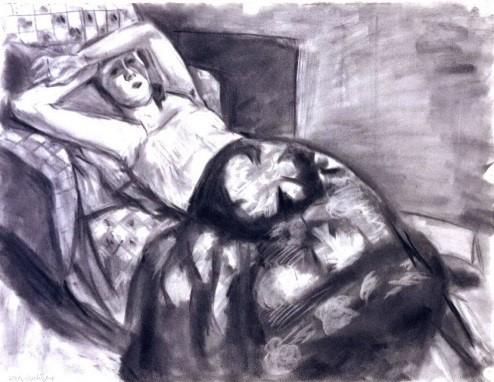 Diebenkorn was in his 20s when he discovered — and got hooked — on Matisse. 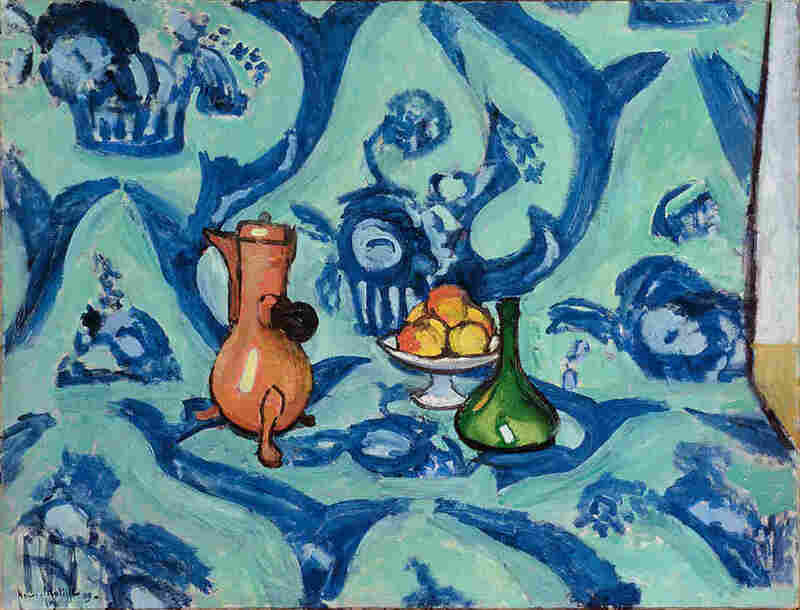 He sought out every opportunity to see Matisse's paintings, Rothkopf says, "It was something that he was interested in throughout his entire career." Wherever he was — Portland, Ore., San Francisco, Santa Monica — Diebenkorn collected books on Matisse, stuffed sketchbooks with clippings, postcard reproductions, notes. He loved the master's depictions of women, his adventures with abstraction, his style — which shifted, depending on where he lived — and, of course, his joyful colors. Diebenkorn's colors shimmer — delicate veils of blues and greens and greys. Teaching in Urbana, Ill., in 1952, he said he saw nothing but haystacks. He was starved for colors. "So he decided to black out the windows of his studio and made these beautiful abstractions really from his imagination," Rothkopf says. Grant says there was one year, though, when her father capped his color tubes. 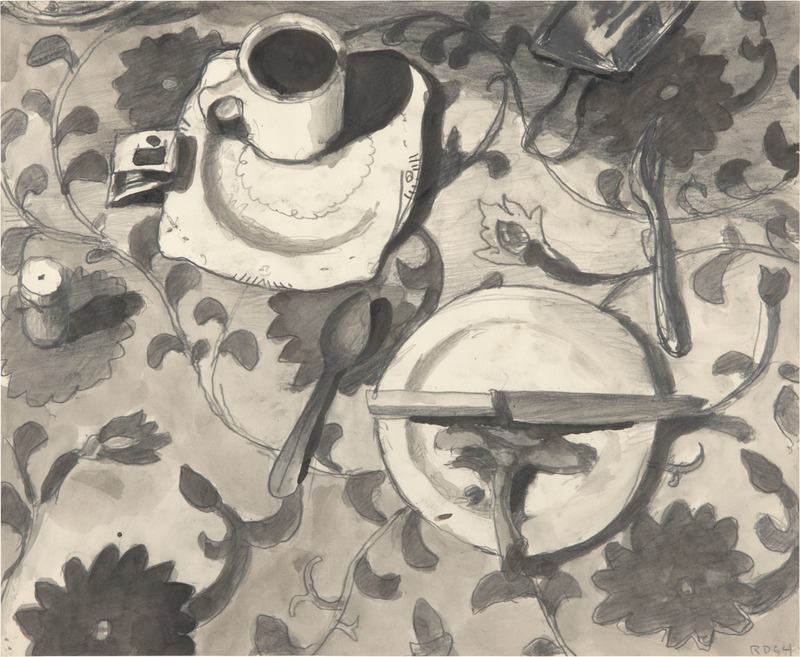 She points to a black, white and gray painting of a place-setting on a patterned table cloth. There's a single lamb chop bone on the plate. He made this painting in 1964. "This is the year that my grandfather died," Grant says. "And in that year he did only black and white drawings." The paintings are not somber, though. 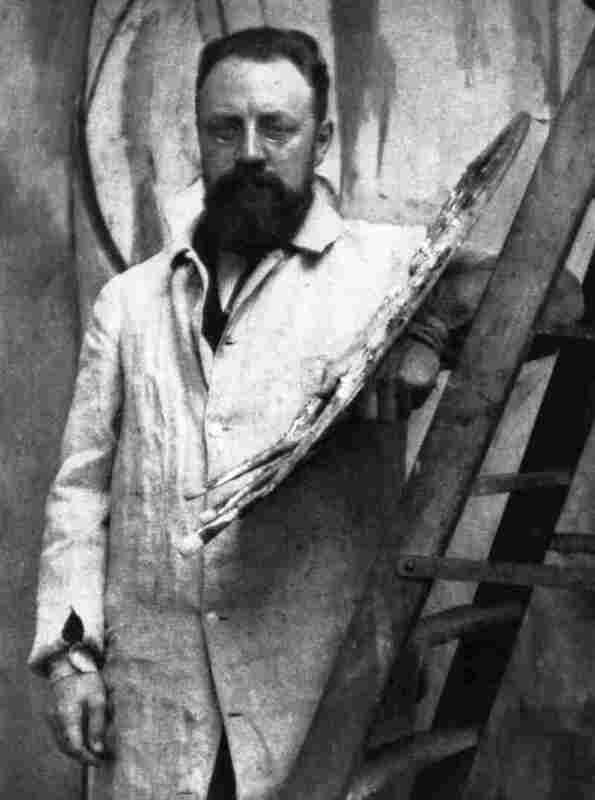 French painter Henri Matisse in his Paris studio. "They're not depressing, they're not mournful, really," says Grant. "They're just — this is where he was, I guess." The black and white works are in various museum collections. When Gretchen spots one, she doesn't have to look at the date. She knows it was made in 1964. Sophie Matisse has no first-hand stories about her great grandfather Henri; she was born 11 years after he died. And her grandfather, Pierre — Henri's youngest child — kept pretty mum. "To be perfectly honest, he didn't really talk a lot about his father and didn't even answer questions," she says. Matisse will never forget the one time her brother, attempting to make dinner conversation, asked her grandfather to tell him stories about what it was like having the great artist as a father. "Pierre never moved a muscle," she recalls. "He was just there at the table, stiff as a statue, and just suggested that he go read a book about it. ... We didn't really talk about family stories after that." "I think he'd been asked too many times," Matisse says. "I think their relationship was solid, actually, and very good, and very deep, and very intimate and private. He wasn't a big sharer of feelings ... what happened between them more or less stayed between them." Matisse and Diebenkorn shared an intense work ethic and dedication to craft. 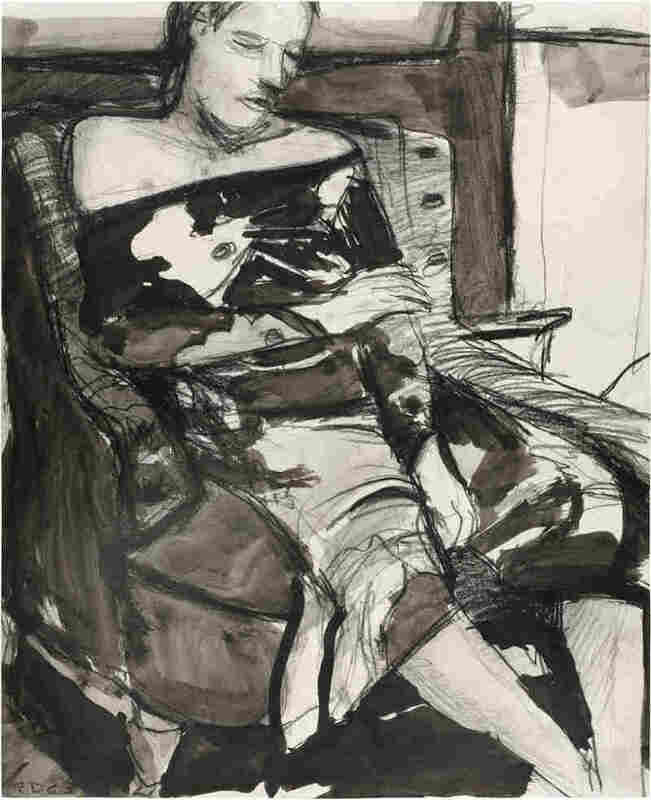 Diebenkorn painted every day and, as his daughter recalls, was not to be interrupted. Grant says she never went to the studio except when invited. "I only remember knocking on the studio door once," she says. "That was his space." He worked all day, and the family wouldn't see him again until dinner time. Grant has many loving memories of her famous father. Sophie Matisse's connection to the great artist in her family is somewhat farther removed; she says at times her name has been a burden, but it obviously is also a "tremendous honor." Grant — an actress and singer — says when she got married, she was happy to change her name. "First of all, it was always the longest name on a program ..." she says. "I got tired of being reviewed '(the daughter of the artist).' You don't want to be an adjunct somehow." The two women move happily through the artworks of their ancestors, gathered at the Baltimore Museum of Art. Matisse's voluptuous harem women coexists with an abstract Diebenkorn landscape. A Diebenkorn still life, swirled with Matisse-y blues and curves recalls Matisse's Still Life with Blue Tablecloth. In the art of this knockout show, you can almost hear the artists speaking to one another. "This exhibition will give them the opportunity to have a conversation on our walls for the next three months," says Katy Rothkopf. The artists never met in real life, but there's no doubt they are here together. This spring, they'll head West, when the exhibit moves on to the San Francisco Museum of Modern Art.